The Word “creed” comes from the Latin word “credo” which means “I believe”. The Creeds are the statements that contain a summary of our basic beliefs. In the Episcopal Church we say both the Apostles’ Creed and the Nicene Creed in our worship. The Apostles’ Creed dates from the early years of the Christian Church and was used as a statement of faith at Baptism. The Apostles’ Creed is included in the services of daily Morning and Evening Prayer that may be used both at church and in private devotions. 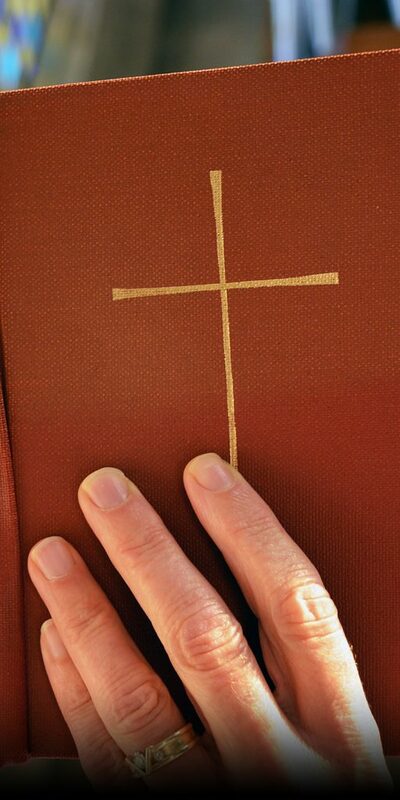 It can be found in the Book of Common Prayer on pages 53, 66, 96 and 120 within these different services. He suffered under Pontius Pilate, was crucified, died and was buried. the forgiveness of sins, the resurrection of the body, and the life everlasting. Amen. The Nicene Creed was written in the year 325 by early bishops meeting in Nicaea (modern-day Turkey). It is a statement which summarizes the Christian faith and is said in unison during services of the Holy Eucharist (the reenactment of the Lord’s Supper). It can be found on pages 326 and 358 in the Book of Common Prayer. of one Being with the Father.Through him all things were made. By the Power of the Holy Spirit he became incarnate from the Virgin Mary, and was made man. We look for the resurrection of the dead,and the life of the world to come. Amen. Also referenced in the Book of Common Prayer (page 864), the Athanasian Creed offers a clearer definition of the Trinity and Incarnation. Because we are a community of faith, we openly declare our beliefs and in this way unite ourselves to Christians in the past, present and future. Relationship with God is a personal journey and also one we share with others in this community of faith. The Creeds clearly state the beliefs of the Church and we recite them as we join with those around us in the process of discovering our own relationship with God. So it’s not easy to answer this question “yes” or “no”. The importance is to take part with fellow seekers in this lifelong journey. It’s not unusual to have doubts or questions. In The Episcopal Church, questions are encouraged. There are groups, classes and forums available for discussing questions with other seekers. One opportunity is the inquirers’ class, offered in the fall or in the summer. In addition, the clergy are eager to be contacted for help with questions.